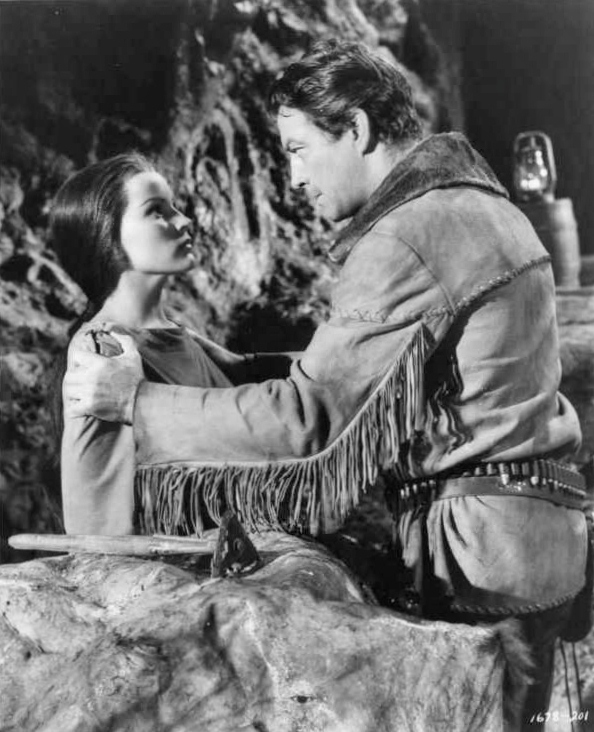 Robert Taylor in this makes John Wayne's Ethan Edwards look like a Sunday School teacher. 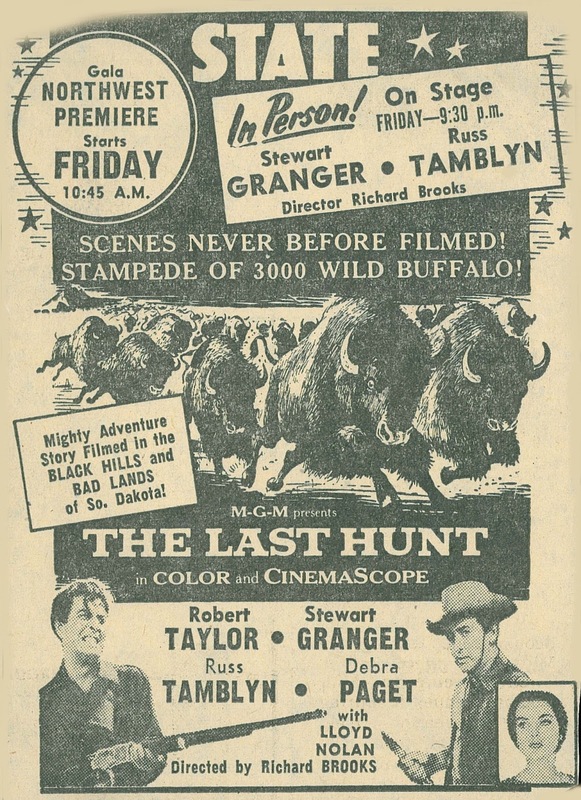 I don't know a rougher major studio western made in the 50's, and yet few recognize The Last Hunt on mention. Is it fact of more-or-less unavailability since '56 release, other than pan-scan TV? That's rectified now via fine scope render by Warner Archive. Bob and partner Stewart Granger (is the latter attempting a Southern accent?) seek buffalo amidst frozen wilds that drive Taylor to homicidal extremes. The prewar matinee idol again registers darker than dark and ramps Old West noir to level of heavy-lidded menace few stars of his stature would have dared. What RT effected after service discharge was nothing less than image transform that put much of his postwar work in a rogue's gallery unknown to then-stellars at Metro. Did the studio, like us, sense Bob's greater aptitude for sinister? Others are dwarfed by him. I'd like knowing Debra Paget or Russ Tamblyn's impression of Taylor unplugged. He seems to have been placid enough while cameras weren't turning, but when engaged at Last Hunt performance, downright scary. Richard Brooks wrote and directed, so expertise at both is assured. The ending is a chiller in more ways than being mere snowbound. The Last Hunt was not profitable, going $35K into red, this no disgrace in an MGM year when most of what they released lost money. 1956 saw Dore Schary go on skids that would lead to ouster from the company. Patronage was past novelty of Cinemascope, its use no longer a guarantor of grosses. 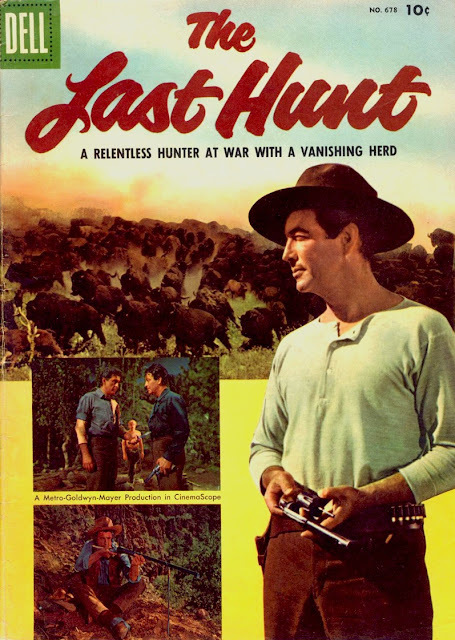 The Last Hunt was majestic for locations chosen in South Dakota, premiering there a foregone conclusion after the state's governor extended full co-op to Metro. 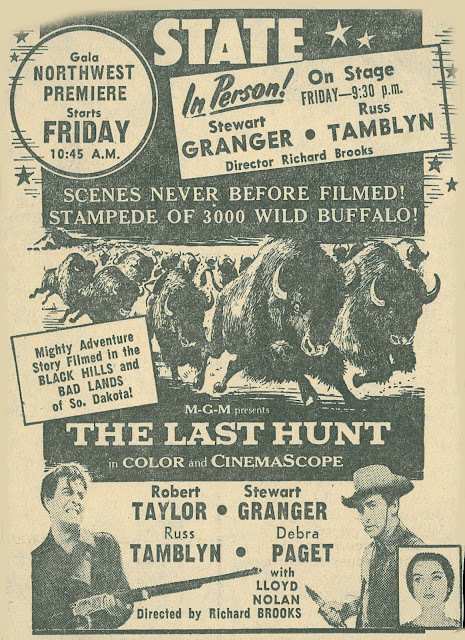 He'd even declare a "Last Hunt Week" to celebrate the 2/16/56 open in Sioux Falls. Columnists and critics got vapors watching buffalo slaughtered on screen, this necessary to the narrative and S.D. wildlife authorities whose annual duty it was to thin out herds. That process, and need for same, was publicized to take sting out of bison being felled by dozens. Would today's humane authority permit any animal to be killed before cameras, whatever the circumstance? The Last Hunt may have been a final occasion for such ritual to be captured for a mainstream feature. A little surprised over outrage at buffalo carnage. Pretty sure the Three Stooges flick "The Outlaws is Coming" had similar footage, and that didn't seem to stir anybody up (but then, I was just a kid and may have missed any controversy). 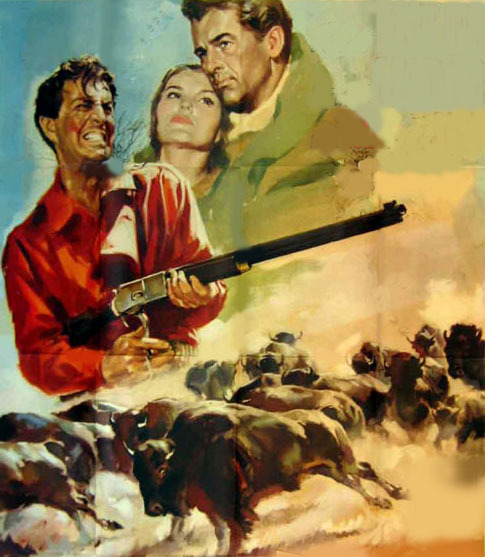 I think we just perceived the buffalo as livestock -- Indeed, the plot of the film had the villain encouraging buffalo slaughter to provoke the Indians, who were dependent on buffalo meat and hides. It was, in effect, more like cattle rustling than wildlife abuse. The one that really unsettles me is "Tarzan and His Mate." The climatic battle between lions and elephants is, for the most part, obviously achieved through editing and special effects (like most of the mayhem throughout the series). But there are also evidently real shots of lions flipping over when shot. It's jarring in a film that's otherwise emphatically artificial -- like real war footage spliced into a featherweight service comedy. Did movie audiences even care, or did they assume it was all movie magic?